Neurons in brain talk to each other at synapses which connect neurons into vast communicating synaptic circuits. Synapses are specialized intercellular junctions that are diverse and dynamic. The number, locations, and distinct functional properties of synapses confer onto synaptic circuits an enormous complexity that is essential for information processing by these circuits. Insight into how synaptic connections in such circuits are specified represents a multifaceted problem that includes four interrelated questions: 1. How does a neuron identify the correct target neurons for synapse formation? 2. How does a neuron form a synapse on specific parts of that target neuron, e.g., distal dendrites or axon hillocks? 3. How is the decision reached, whether to keep or to discard a given synapse after it has been formed? 4. How is the functional diversity of synapses generated and controlled? 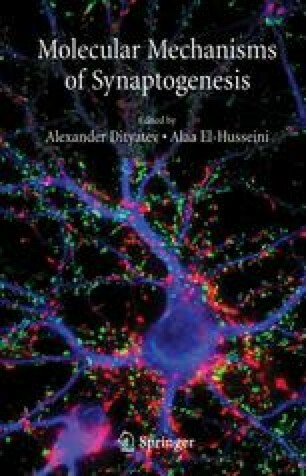 Clearly synapse formation means more than just establishing contacts, and includes specification of the dynamics and types of these synaptic contacts. Although much remains to be clarified, the available data suggest that axonal pathfinding is a major component in establishing synaptic specificity, that initial formation of synapses is fueled by mechanisms that involve multiple cell adhesion molecules, and that the development of synaptic properties and use of a synapse are crucial in the decision about whether or not a synapse survives.